We love stuffed peppers so much, we have them at least every couple weeks! Sometimes we even have them every week. These are kind of fattening (which is GOOD!) and very yummy. Preheat oven to 350. Cook the rice according to package directions. Meanwhile, brown the meat, onions, garlic, and olive oil together. Add spices and tomato puree; let the mixture simmer for 10 – 15 minutes to absorb the flavors. Add the cooked rice to meat and tomato mixture. Cut green peppers in half, deseed, and wash. Place peppers in a baking dish and stuff with mixture. Bake 30 – 40 minutes, or until peppers are tender. If cheese is desired, add it in the last 5 minutes or so of baking time. Serves 4. As we’re dairy-free, we don’t use the cheese. But they’re flavorful enough without it. You can also use 3/4 cup rice to stretch the filling a little further if you have a hungry family; we do this sometimes. I hope you enjoy them as much as we do! 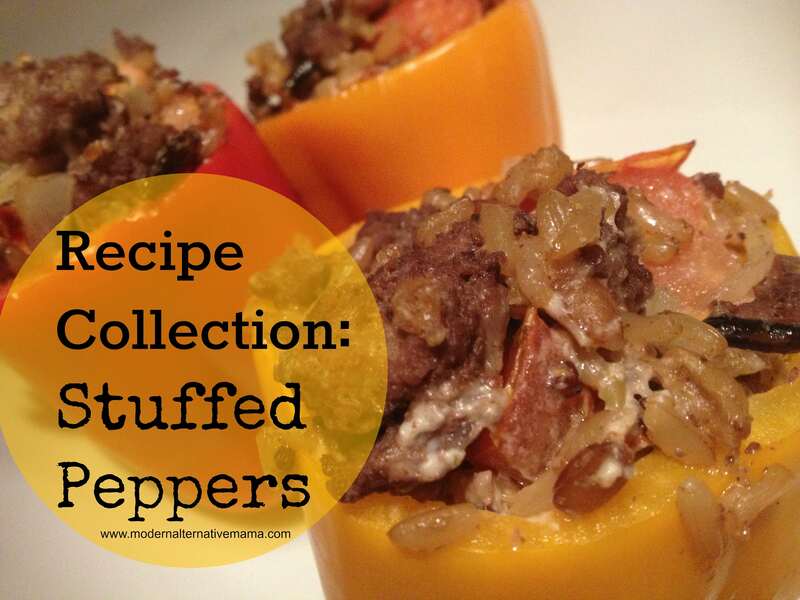 Do You Enjoy Stuffed Peppers? What Do you Put In Yours? I love stuffed peppers! I am bookmarking this recipe to try! These sound SO good, but unfortunately I can't get my family to eat them, darn it. I'll just make them for myself sometime! Thanks for joining in on Real Food Wednesdays. I just gave you a stumble. 🙂 OH, and if you could give a link back to the RFW post in your post, that would be great, so your readers can find more tips and Real Food recipes. Thank you! when I was a kid, my brother and I didn’t like the taste of the whole pepper cooked. To remedy that, my step-father began to chop the pepper into pieces with the onion.. It was a hit then and it’s a hit with my children now. We call it pepper sauce. Everything would be the same except where you add the pepper, there is no baking (more hot summer home friendly), and we serve it over rice. This freezes well too.